Two weeks ago, my husband and I took a trip to the East Coast, beginning in New York City and ending up in Boston. Because of hotel prices outside our Midwestern budget, we decided to try our first experience with an AirBNB house. On AirBNB, regular folks offer up anything from a couch or air mattress to a fully furnished apartment to guests. We rented a bedroom with a single woman in New Jersey. When it was time to go, we carefully checked the dressers, closet, and bathroom to make sure we were leaving nothing behind. I was waiting for the Amtrak at Penn Station when I reached into my pocket an realized my rosary wasn’t there. In the habit of saying it before bed, I often find it somewhere under the covers or on the floor the next day. It wasn’t a special rosary, or particularly pretty — just cheap plastic beads on white string, the kind I had dozens of growing up because a woman at our church made them copiously. I have no idea where this particular rosary came from — I know only that it was the “last rosary standing” in a collection that had once been dozens, but that had been winnowed down over the years when chains broke, or they got left behind on trips, lost in the depths of forgotten suitcases, consciously downsized or put somewhere for “safekeeping” that I subsequently forgot. I knew I could get a new rosary, although I had to say the prayers on my fingers for the rest of the trip. But what I’m left wondering about is the host who found it in the bed after we left. Did she recognize what it was? Did it alter her perception of my husband and me — were we suddenly transformed from reasonable, progressive Midwestern tourists into religious nuts? And what did she do with it? Did she throw it away? Or, like me, is she eerily uncomfortable throwing away anything with a religious connotation? (This is why I had a cupboard full of crosses that were ungodly ugly when I moved into my grandmother’s house 5 years ago). Perhaps she stashed it in a junk drawer, or pawned it off on a Catholic friend, or mistook it for jewelry. Our host told horror stories about previous guests who had left used condoms or empty booze bottles or wet towels all over her house, but after realizing I’d forgotten my rosary, I felt as if I’d exposed something even more intimate about myself and my after-dark habits. Because outdated and unusual as it is in my generation, the rosary is the one remnant of Catholicism I seem to hold onto despite all else. If our host correctly connected it with Catholicism, she wouldn’t have known that its beads are often the only thing that make me feel connected to my Catholic heritage at all; or that it quiets my mind the way that nothing else can; or that praying it feels like a strangely feminist act, invoking a woman’s name and words associated with womanhood and motherhood again and again and again. She won’t know how I laid on the floor of my bedroom praying the rosary as a teenager, my fingers stiff with cold because there was no upstairs heating; or how I hunched on bathroom floors praying it when I was sick at college; or how my cat, snuggled into my arms, gnaws on the beads as I pass them through my fingers each night. She won’t know that, as much as I’ve discarded from my 2nd-grade CCD teacher’s instruction, I still cling to her promise that the angels will finish my prayers if I fall asleep before doing it myself; and she won’t know that my parents and my sisters are most often the unknowing recipients of my rosary meditations. She’ll know only that I traveled with a cheap plastic remnant of pre-Vatican II days, and that I didn’t have the courage, in our brief correspondence after the trip, to mention how much I’d left behind. 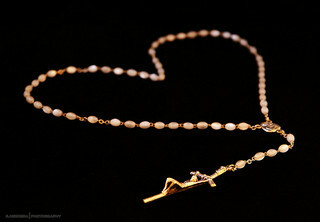 This entry was posted in Spirituality, Women & Gender and tagged prayer, the rosary by Lacey Louwagie. Bookmark the permalink.